Q: Am I available for Skype visits? A: Yes...although they may be difficult to schedule due to the time change. But there is a solution! I'm happy to answer SEVEN questions from your book club via a YouTube video. Please email me to arrange a virtual visit. Q: What should I serve at my book club meeting? My suggestion? Choose ten questions...and have fun! 1. 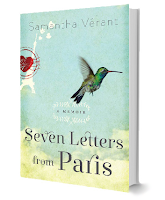 In Seven Letters from Paris, Samantha unearths seven old love letters written by Jean-Luc, the Frenchman she met in Paris when she was nineteen. Do you keep old love letters? Why? What purpose do they serve? 2. Samantha describes her first encounter with Jean-Luc as un coup de foudre, a shock of lightning to the system. Do you believe in love at first sight? 3. Have you ever contacted-- or thought about contacting-- ‘the one who got away’ or an old flame from your past? How has the Internet changed our lives, making it possible to connect or reconnect? 4. Sometimes friends need a push in the right direction. What are Tracey's true intentions when she suggests the ‘love blog’? What do your friends do for you when you're down in the dumps? What do you do for your friends? 5. As Samantha questions her past, she comes to a realization: she’s been so afraid of falling in love she’s never truly done it. Discuss how her fear of abandonment affects her failing marriage to Chris, her relationship with her adoptive father, Tony, and her burgeoning romance with Jean-Luc. Have you ever suffered from self-doubt or insecurity when it comes to love and opening up your heart 100%? 6. Samantha decides to face past regrets and fear head-on, apologizing to Jean-Luc after a twenty-year hiatus. Are you a believer that you can make up for past regrets? Or should the past stay in the past? What do you think of Jean-Luc’s seven letters? Would you have written him a two-decades late apology? 7. In letter one from 1989, Jean-Luc writes, “Please don’t think it’s easy for me to express my feelings in a letter, but when your heart beats for somebody, I believe it’s best not to hide it. Perhaps you believe it is too quick to declare my feelings. Perhaps most people would think that it is, but I don’t care about the way others live, because I’m doing what I need to do to express myself to you.” How does this first sentence relate to the overall theme of the book? 8. After Jean-Luc responds to Samantha’s ‘delayed apology,’ email after email, she reveals her life to Jean-Luc, explaining that it’s easy to do when hidden behind a computer screen. Yet, when she finally garners up the courage to leave her marriage, she writes Jean-Luc a ‘Dear John’ letter: “Everything in a relationship is passionate in the beginning. But like a star, this kind of intensity fades in brightness over time. After time, things get comfortable—like an old pair of socks, holes included.” Do you think passion fades? Or can a couple keep romance alive? Can marriage change a person? And can a person change? Are there some people who can bring out the best in you, and others the worst? Do we see changes in Samantha after she leaves her marriage? Are these changes positive? Do you think Samantha should have fought harder for her marriage? If Jean-Luc hadn’t responded to Samantha’s apology, do you think she would have stayed married to Chris? Have you ever followed a dream to realize it wasn’t yours? Have you ever taken the safe route, only to find yourself stuck in the mud years later? What steps did you -- or do you want to -- take dig yourself out? As you’ve matured, how have your dreams changed? 11. At the end of chapter seven, Samantha says, “If life was the sum of the choices I’d made, I was just going to have to make better decisions. Starting now.” How does her attitude toward life and love evolve in ensuing chapters? 12. What would you do if a man you’d only known for twenty-four hours and three months of letters offered to fly you to Paris? Would you pack your bags? Discuss whether you would have taken the risk (and why) to fly to another country to meet a man you haven’t seen in twenty years or if the notion is down right crazy. 13. “We’re laying the foundation for the rest of our lives. Now, all we have to do is build.” How did letters, phone calls, and distance help Samantha and Jean-Luc build the foundation for their relationship? an intimate bond with your partner? Or is living a passionate life much more than that? 15. On the ‘rekindle the romance tour,’ Samantha is surprised when Jean-Luc doesn’t get angry while standing in line at Château de Chambord. What is it from her past that has her expecting a volatile reaction? 16. Family is important to Samantha. What are Samantha’s relationships like with her mother, her father, and her sister? How did Samantha assimilate into the lives of Jean-Luc’s children, Max and Elvire? What did she do right/do wrong? Is it important to you for your family to like your partner/spouse and vice versa? 17. 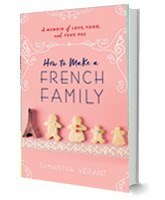 On Samantha’s first visit to France over Christmas, Jean-Luc’s family and friends welcome her with open arms and air kisses, yet, still fear and doubt creeps in. Thanks to Jean-Luc’s support, she gathers her courage with a “Yes I can” attitude, but becomes discouraged when planning the wedding, due to legal tape and her missing birth certificate. Do you relate to her fears and frustrations? Have you ever been so overwhelmed by circumstances that you’ve just wanted to give up? Do love and support conquer all? 18. Throughout the book, Samantha makes many faux pas while trying to speak French. Have you ever made embarrassing errors when speaking another language...or even in your own tongue? 19. Jean-Luc’s stance on religion is scientific, how nature hates empty spaces and needs to be filled; Samantha’s is more spiritual. Discuss the significance of the hummingbird, the space station, and the climbing rose bush. 20. “You have to promise to trust me. All relationships take work—both on physical and mental levels—and I think, together, we can do it.” What do you think of Samantha and Jean-Luc’s pact to keep no secrets from one another? Is there something you’ve kept hidden from your partner or spouse? What kinds of secrets are meant to be kept? 21. Through closure, Samantha finds a way to forgive Chuck when he pops up unexpectedly into her life after a twenty-year silence. Do you think she made the right decision when she tells him she doesn’t want him to be a part of her life? 22. Samantha decides to burn up her past, save for Jean-Luc’s seven letters. She thinks it’s a romantic gesture. Is it? Would you ever burn your old love letters? 23. Looking back to the preface, Samantha gives us a glimpse of her new life in France after two years of marriage. “Tonight I'm cooking from the heart, choosing self belief over fear.” What does the meal symbolize? What is the significance of the bracelet? 24. In one year, Samantha faces many stress-inducing/life-changing situations: a job layoff, a divorce, moving back home to the parents, turning forty, a temporary career change, a bankruptcy, the death of her dog, health issues, a remarriage, moving to a foreign country, and becoming a stepmother. How do you think she handled everything? What would you have done differently? Do you think Samantha ran away from her problems? Or, did she face them? 25. Do you believe in happily-ever-afters?